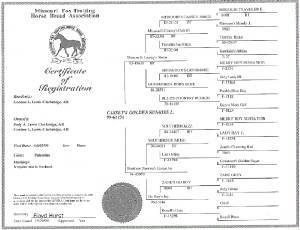 All of our horses are registered with the Missouri Fox Troting Horse Breed Association in accordance with the By Laws of the MFTHBA. All but two of our horses are Blue Papered. If you should have any questions concerning any of our horses, please feel free to contact us. Thanks for your interest in Bar_d_foxtrotter Ranch.